To begin, I have two threads of research that will further be elaborated to become more specific, yet both still fall under the category of Christianity coexisting with the world. My first engages in the grey-area of Christian feminism, and the second in a flaneur perspective in a secular world. Feminism has become a word in everyone’s mouths lately, due to the political and social climate across the world. Initially, I didn’t dare to call myself a feminist because of all the causes associated with the title. However, I still believed in the fundamental elements of feminism. So what does the Bible say about it? What is stopping me? I finally found a book called Jesus Feminist by Sarah Bessey that clarifies and broadens the subject. It has been very engaging and intriguing. It provides a generous amount of context, clarity, and examples. It has encouraged me to accept it, but also to further investigate. Women are very prominent in the Bible actually. Ruth (who broke the rules but honored God), Rahab of Jericho (who hid the Israelite spies and saved her family during the siege), Esther (saved the Jews, by risking her life in front of the king), Tamar (who outsmarted dishonorable men to defend herself), Lydia (wealthy businesswoman who financially supported the apostles) Mary and Martha (both served Jesus and learned from their grief), and Mary (mother of Jesus) are to name a few. Yet Sarah Bessey also connects it to women of Church history like Florence Nightingale, Mother Teresa, Dorthy Day, Harriet Tubman, Amy Carmichael, Corrie ten Boome, Evangeline Booth, and Gladys Aylward. It’s extremely encouraging and uplifting. Yet, I would like to further investigate why women like them are pushed aside, and instead Disney princesses are largely glorified. Writers like Mary Wollstonecraft, are infamous for their feminist activism, critiquing the modern practices of their time in attempt to reach the ideal. I believe through my research, my goal of blending Christianity with feminism may be uplifting, and encouraging to achieve. I aspire to use both her book and the Bible, as well as other non-religious perspectives to unveil how Christianity and feminism can be together, and why they are not (public) presently. The term flaneur is defined as “the casual wanderer, observer and reporter of street-life in the modern city, which was first explored by author, Charles Baudelaire.” However, as a Christian, I relate to this title past street-life vs urbanization. My encounter with Christ has widened my eyes to see the world in a bigger picture by observing larger themes, seeing past the ordinary, and appreciating the immaculate details. Living as a faith-filled flaneur, there is more gratitude, generosity, hope, and peace. There is more time channeled on viewing the small things, and appreciating it’s presence, regardless as positive or negative, and cherishing it with praise. A lot of writers for instance are considered flaneurs, due to their ongoing search of spinning the present and commenting or creating around it. 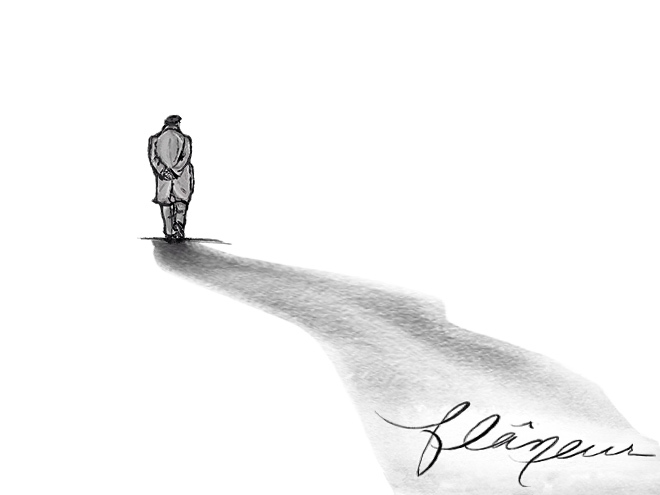 Josephine Livingstone and Lovia Gyarkye write, “The flâneur walks around the city. He is in constant pursuit of knowledge, appreciates aesthetics, and feels most at home in crowds. He is a default subject with no markers of identity. He is male and unattached, or simply a converted feminine mirror, in Elkin’s conception. He is pure receptacle, a pair of eyes with no human relationships and a politics only of witnessing. In our moment, writers and curators may be drawn to the flâneur because he represents the opposite of identity politics, and a fantasy of a time when a universal subject was a realistic proposition. Our contemporary discourse holds that who you are influences the way that you know, and the way that you can or cannot speak. A woman walking through the world knows in a different way than a man, and by default has greater authority when describing her viewpoint.” Therefore, they argue it’s an ideal figure, but unfaithfully practiced. Bijan Stephen writes, “In the ensuing decades, however, the idea of flânerie as a desirable lifestyle has fallen out of favor, due to the Industrial Revolution and the modern horror at the thought of doing absolutely nothing. But as we grow inexorably busier—due in large part to the influence of technology—might flânerie be due for a revival?” I agree flanerie might be due, and although his explanation of technology as the catalyst may be true, it is only a sliver of the problem. It is the denial of God and instead replacing Him with ourselves, we become our own God. Self-reliant, and untrained to view life from afar. Being a flaneur is typically associated with mobility and the upper class, due to its accessibility. While it may have been applicable during my time abroad, it is still practiced personally on the daily. Its basis of appreciating the overlooked, can be used at any moment. It’s continuing to have a childlike wonder. Brianna Wiest writes, “Just because things happen everyday does not mean they are any less miraculous.” My research regarding this topic will further investigate how to view life like a stranger in this world. I intend to dive into media, the Bible, and other spiritual practices to discover how one can have a different, secular perspective and live life unconventionally. Bessey, Sarah. Jesus Feminist: God’s Radical Notion That Women Are People Too: an Invitation to Revisit the Bible’s View of Women. Darton, Longman & Todd Ltd, 2013. Livingstone, Josephine, and Lovia Gyarkye. “Death to the Flâneur.” New Republic, 27 Mar. 2017, newrepublic.com/article/141623/death-flaneur. Seal, Bobby. “Baudelaire, Benjamin and the Birth of the Flâneur.” Psychogeographic Review, 13 May 2014, psychogeographicreview.com/baudelaire-benjamin-and-the-birth-of-the-flaneur/. Stephen, Bijan. “In Praise of the Flâneur.” The Paris Review, 17 Oct. 2013, www.theparisreview.org/blog/2013/10/17/in-praise-of-the-flaneur/. Wiest, Brianna. “14 Ways To Keep Childlike Wonder Alive In Adulthood.” Thought Catalog, Thought Catalog, 6 June 2013, thoughtcatalog.com/briannaewiest/2013/06/14-ways-to-keep-childlike-wonder-in-adulthood/.